Last week, I purchased a box (about 450) 1" wood balls to make fabric beaded necklaces. I'm planning on participating in the upcoming Gator Fest next weekend and want to spend this week supplementing my current inventory to take to the Fest. 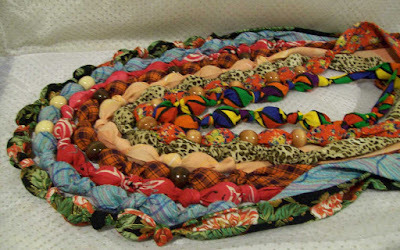 This, of course, includes more Fabric Beaded Necklaces. Although the 1" beads balls are not heavy, they are heavier than the 1" styrofoam balls. I put them into a rather shear scarf and I didn't think that the fabric would hold up well, over the long term. So, I'll only use cotton scarves or fabrics. I'm going to try a few variations on these. In the first set of 8, I incorporated wood beads on a couple; paint and fabric markers on two others. So far, I like them all.